Cutting edge mixology in the heart of the Marais. The bar at La Résistance might easily belong to an apothecary: coloured flagons and boxes of exotic ingredients and chemical apparatus are all lined up here, a contemporary mixologist’s dream. 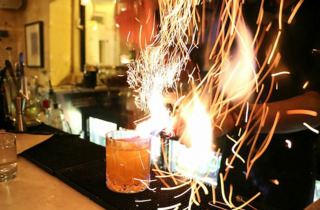 The staff take making cocktails – and the spectacle of it – very seriously indeed. It’s been a huge hit in the Marais, but has managed to keep the atmosphere cheery and relaxed rather than unpleasantly hyper, though it is completely full by 8pm on a Friday. There’s a more lounge-like space downstairs where you can cool your heels with a glass of cucumber water and peruse the menu of house cocktails (they’re €12 each, standard for the area). The inventive recipes list lots of esoteric ingredients, and the results are confident and surprising. There’s a taste for dramatic detail, like the gold glitter on La Part des Anges, made with cognac and vanilla. If you don’t fancy anything on the list they’ll also knock you out a classic cocktail, or even create one specially for you.